This was the first of at least 31 around-the-park walks, that I'll be taking in October. And one of a series of articles that I'm going to be writing about those walks. As was hoped for during these journeys of discovery, it was much more than a typical solitary walk. On Saturday October 1, there was a mini-event in Bethany Park on 11th and Central. Thanks to the help of the Latino Health for All Coalition, a healthy foods element was added to the usual La Placitas event hosted by the Central Avenue Betterment Association (CABA). Often, eating healthy is viewed as a cultural challenge for the Latino community. Of course, many of the foods in the "Mexican" restaurants in this country are Americanized (higher fat) versions. So it was very enlightening for five Latino restaurants to feature lower fat, healthier foods. From a fresh fruit salad to homemade-style papusas, everything was delicious and healthy. This was also an opportunity to walk through Bethany Park and take a closer look at some of the new amenities. The last time I was here, following the Central Avenue Parade on September 10, the park was extremely crowded. Taking advantage of fewer crowds, I took a closer look at the new exercise stations and even tried some of them out. These include some stations you seldom see at a park like a back extension plank and parallel bars, plus such items as stretching posts for the walkers and runners. While some of these are spread around the park, others are clustered together near the Futsal courts to provide kind of an outdoor exercise room. Speaking of the Futsal courts, one of the things that I enjoy in the parks is the opportunity to interact with people in the neighborhood. In this case, there was a group of a half dozen children and an adult in one of the Futsal courts – but they weren’t playing Futsal. They were practicing volleyball with an imaginary net. Taking the time to talk with them, they said that they would love to see a volleyball court in the park because an increasing number of families were interested in that sport. I also had a chance to see some of the pre-work being done to repair and enhance some of the walking paths. Some of them are truly in bad shape, and a lot of them are too narrow for even two people to pass each other comfortably. I could see the signs of some preparatory work that had already been done. 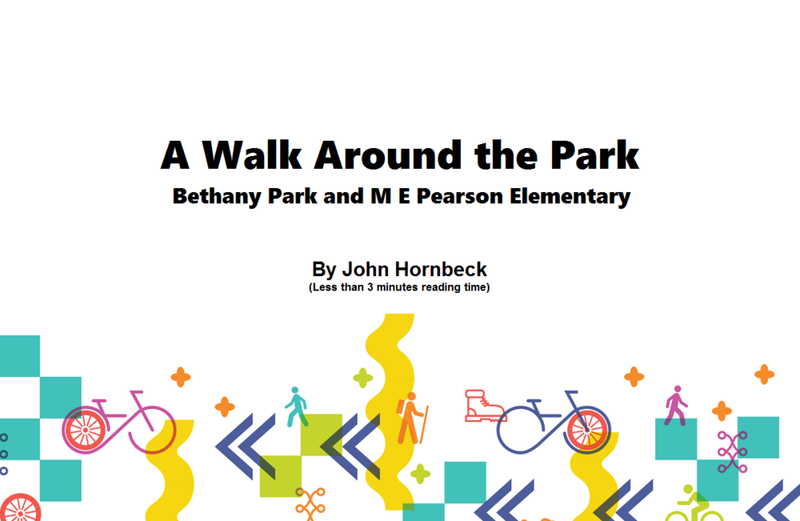 I also took some time to walk the half mile from Bethany Park to M E Pearson Elementary School. 202020 is extremely interested in neighborhood walkability and safe routes to both schools and parks. And this school is located less than a half mile from Bethany Park, on a straight line path along 11th Street between Central Avenue and Splitlog. One would think that this would be ideal for the families in that area, except for that tricky question of connecting infrastructure. Thankfully, the sidewalks in front of the school are in good condition. The trouble is, there are no sidewalks on either side of 11th Street between Ridge and Riverview, more than half of the distance between the school and the park. With an elementary school located within a half mile of a park, walkability is a challenge. And if that wasn't bad enough, Bethany Park is also the site of the neighborhood Community Center, also on 11th Street. So, while the park itself is undergoing a very positive transformation, this lack of pedestrian friendly routes between the school and the neighborhood park and community center is an example of some of the work yet to be done. Some people might say we are asking too much. I say, if you don't ask . . .